We present the case of a 59 year-old man who underwent surgical mitral valve repair three years ago in another hospital for severe mitral regurgitation due to flail of the anterior mitral leaflet. At that time the left ventricle (LV) was severely dilated [LV end-diastolic diameter (LVEDD) 84 mm, LV end-systolic diameter (LVESD) 60 mm] and with systolic dysfunction [LV ejection fraction (LVEF) 50%]. The surgical procedure consisted of resuspension of the mitral anterior leaflet with artificial cords and annuloplasty with a 37-mm diameter ring. The patient was discharged with moderate residual mitral valve regurgitation and improved exercise tolerance. At the current examination the patient complained of exertional dyspnea. Clinical examination revealed a holosystolic murmur at the apex that radiated to the left axillary region and no signs of systemic or pulmonary congestion. Electrocardiogram showed atrial fibrillation with a well-controlled heart rate, and complete left bundle branch block. BNP was 528 pg/ml. At transthoracic echocardiography the LV was severely dilated (LVEDD 80 mm, LVESD 61 mm), with global systolic dysfunction (LVEF 42%) and no significant regional wall motion abnormalities. There was severe dilation of the mitral annulus (antero-posterior diameter of 48 mm) and asymmetric leaflet apposition leading to severe MR with an eccentric posterior regurgitant jet. There was severe pulmonary hypertension with an estimated systolic pulmonary artery pressure of 77 mmHg. The right ventricle (RV) was dilated (RV basal diameter 43 mm), with significant systolic dysfunction (RV fractional area change: 30%). 2D examination revealed a fixed hyperechogenic structure located in the middle of the mitral annulus plane (Figure 1). Figure 1. Transthoracic echocardiography, modifi ed apical 4 chambers zoomed view. Hyperechogenic structure located at the level of the mitral annulus (red arrow). LA – left atrium, LV – left ventricle, RA – right atrium. Figure 2. 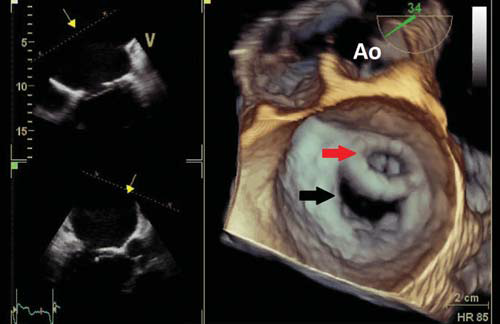 Real-time 3D transesophageal echocardiography, “surgical view”, showing the dehiscence and anterior migration of the surgical mitral ring (red arrow). Note the dilation of the native mitral annulus and the orifice created posterior to the surgical ring (black arrow). Ao – aorta. Figure 3. Transesophageal echocardiography, color Doppler examination, mid-esophageal long-axis view. A) Diastolic frame showing forward transmitral diastolic flow through (red arrow) and posterior (green arrow) to the surgical mitral ring. B) Systolic frame showing the eccentric severe mitral regurgitation jet located posteriorly to the surgical ring, the orifice of which is closed in systole by the anterior mitral leaflet (blue arrow). LA – left atrium, LV – left ventricle, Ao – aorta. 3D transesophageal echocardiography allowed a better assessment of the mitral valve showing partial dehiscence of the surgical mitral annulus and its anteanterior migration. Therefore, a double orifice was created between the LA and the LV: one anteriorly, through the surgical ring, and the other one posterior to the surgical ring (Figure 2). Forward transmitral diastolic flow was visible through both orifices (Figure 3A). The severe MR jet was seen through the posterior orifice (Figure 3B) and was not visible through the anterior one, which was closed in systole by the anterior mitral leafl et (Figure 3B, blue arrow). 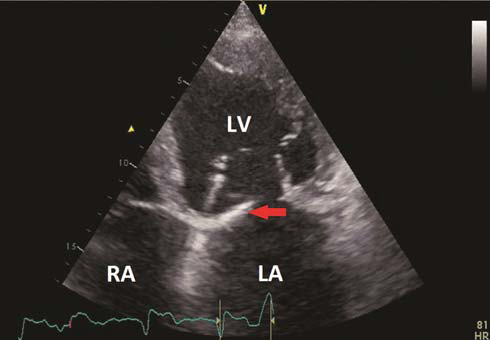 Considering the severe dilation of the LV, the biventricular systolic dysfunction, the level of pulmonary hypertension and the technical difficulties of a reintervention on the mitral valve in this case, the “heart team” recommended conservative treatment.